This galactic bubble is known as RCW 120. It lies about 4300 light-years away and has been formed by a star at its center. The star is not visible at these infrared wavelengths but pushes on the surrounding dust and gas with nothing more than the power of its starlight. A new 'phase' of water that is electrically charged has beendiscovered in space for the first time. The weird spacewater vapor was discovered in an interstellar dust cloud by the EuropeanSpace Agency's Herschel space observatory. Unlike the three more familiar phases of water ? namelysolid ice, liquid water and gaseous steam ? this newfound 'phase' doesn't occurnaturally on Earth. In the birth clouds surrounding young stars, ultravioletlight is pumping through the gas, and this irradiation can knock an electronout of the water molecule, leaving it with an electrical charge. "This detection of ionized water vapor came as asurprise," said Arnold Benz of ETH Zurich in Switzerland. "It tellsus that there are violent processes taking place during the early birth stageswhich lead to widespread energetic radiation throughout the cloud." The detection of this weird form of water was announced Thursdayduring a major scientific symposium held at the European Space Agency (ESA),which runs the observatory, in Noordwijk, Netherlands. 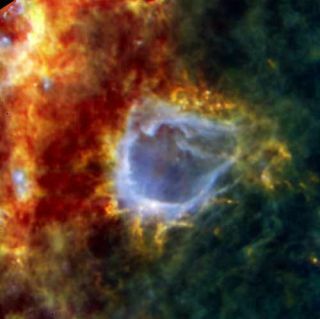 The first scientific results from the Herschel observatoryalso included newviews of massive star formation and a temperaturereading of a frigid cloud of gas and dust, were released at the symposium. Herschel launched in May 2009 alongside Europe's Planckobservatory, which will detect the cosmic microwave background radiation ofthe universe.